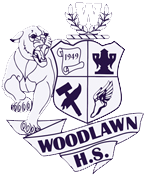 Woodlawn High School offers the Talented Program for students that have been identified as talented for grades 9-12. Students may be identified as talented in one or more areas. We offer self-contained talented classes for Talented Visual Arts and Talented Theater. Students with the Talented Music exceptionality receive their services through a talented pull-out program. Talented classes, both self-contained and pull-out, are taught by teachers that are experts in their fields and offer the opportunity for students to further develop their skills and grow as artists in their areas of study. Talented students perform or display their works at several community events throughout the school year.